This was originally posted in February 2010. How time flies! And the holiday of love and affection is in less than two weeks. 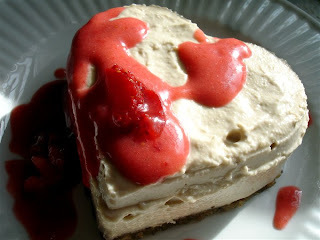 I hope you'll enjoy these Valentine's Day ideas as much this time around. 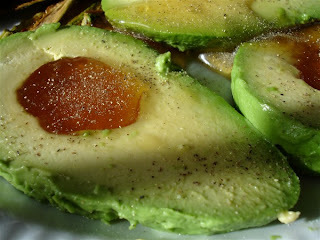 One of my favorite things is an avocado with a little bit of agave in the center and some salt and pepper ... although it's always reminded me of eggs (the look and feel, not the taste). So, this is meant to somewhat resemble what's thought of as a "traditional" breakfast. It's certianly hearty. Marinated and dehydrated zucchini make a crunchy "bacon." I was going to call it "green eggs and ham" ... but Dr. Seuss and Valentine's just didn't mix for me today. The "bacon" has to be started the day before. Thinly slice the zucchini (peel, if not organic). Whisk together the olive oil, agave, balsamic vinegar, garlic, salt, pepper, and red pepper flakes. 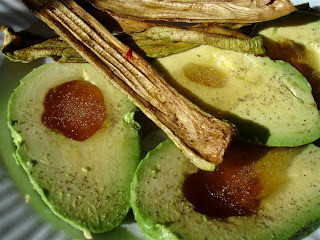 Put the zucchini strips in a container or plastic bag and pour the marinade over, coating all the strips. Let marinate for about 2 hours and then arrange the strips on a teflex dehydrator sheet. Dehydrate for 2 hours then flip. Allow to dehydrate for several hours or overnight. Making the "eggs" part of this is so simple. 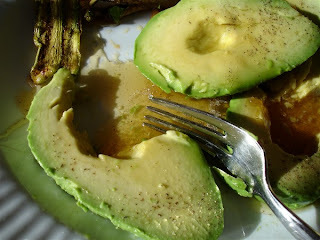 Slicing an avocado and arrange on a plate. 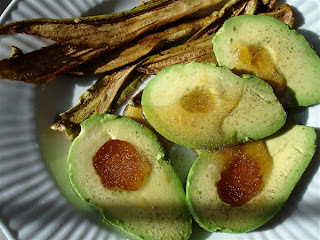 Fill the holes with a small dollop of agave. Salt and pepper to taste. 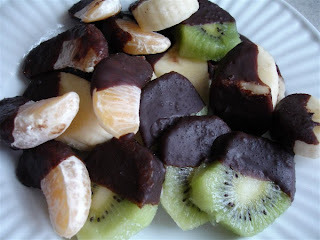 Coconut oil melts at 76 degrees F, so in the cold here, that means a crunchy chocolatey shell on the fruit. Melt the coconut oil over gentle heat. Placing it in a bowl with another bowl of hot water underneath is enough. Once the coconut oil is liquid, stir in the agave, cacao powder, and salt. 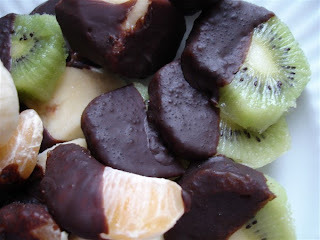 Dip the chilled fruit in the chocolate. The chocolate will harden on the cold fruit in just a few seconds and the chocolate shell should stay fairly hard at normal room temperature. 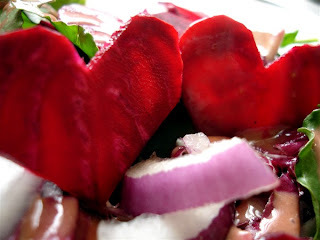 I heart beets. 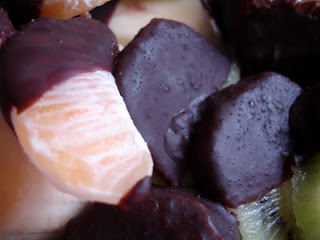 I never even liked them before, cooked that is ... but raw beets are sweet and earthy and not overpowering at all. 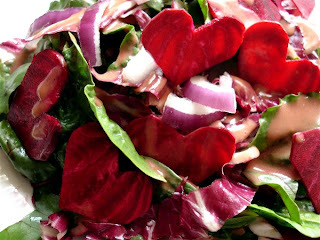 And who doesn't love a salad with red hearts all over it? This is pretty simple. 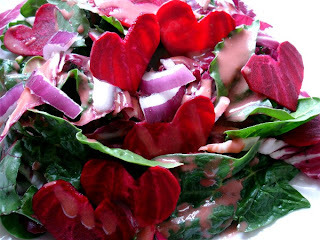 Just rinse the spinach, chop the radicchio and beet greens into strips, slice the radishes, and dice the onion and toss. Cut the beet very thinly (I used my food processor) and use a knife or kitchen scissors to cut the beet slices into heart shapes. Arrange on the salad. Make the dressing by pureeing the strawberries, olive oil, agave, garlic, and salt & pepper in a blender until smooth and creamy. 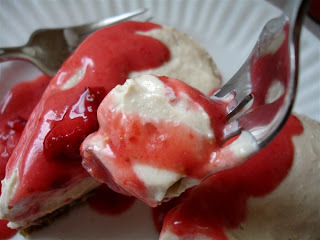 I found I actually prefer a salad dressing without the strawberries and if I make this again, I would omit them and just whisk the dressing ingredients together. 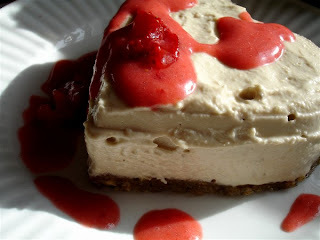 Press the crust mixture into a small tart pan or other suitable container. I used a large, heart shaped cookie cutter, which just happened to be the perfect size (and shape!). Pour the filling into the crust. Cover and freeze for at least 3 hours. To serve, if necessary, unmold your cheezcake. This is going to depend on what container you've used and might required gently heating the outside of the container. Dipping the mold in hot water will generally work. 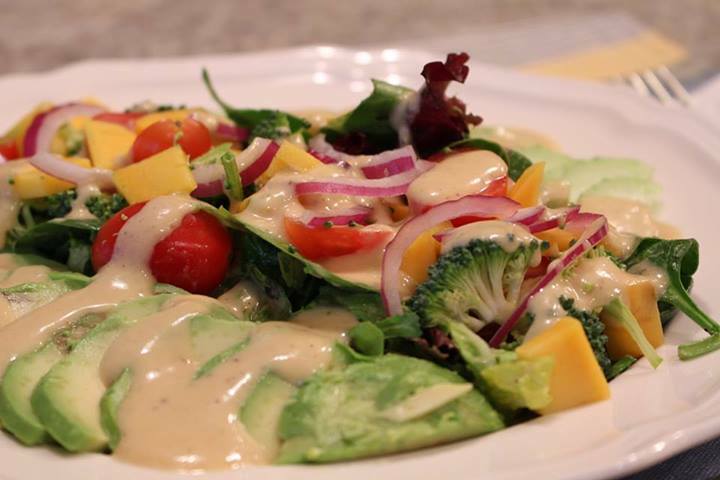 Here's a pic of Kathy Hemingway Desruisseau's photo of the Mango Tahini Dressing from this week's 7 Day Raw Meal Plans ... Get your own 7 Day Raw Meal plan at the link below. 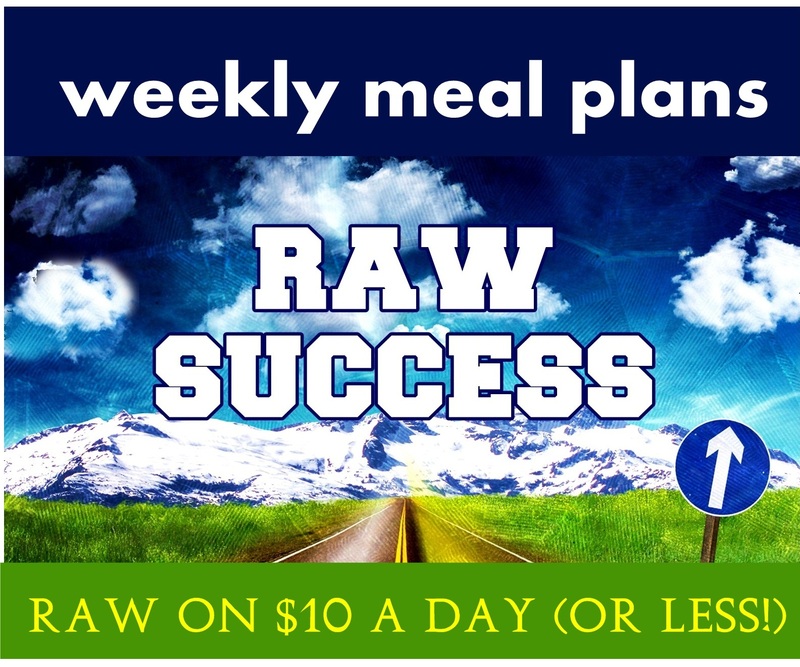 "Anything is possible, if you have the right plan ... "